Warning: Exposing the ILLUMINATI in media can definitely be R-rated. The point of this is to wake up people, and often the Church to the evil that is around us but hidden symbolically, and then, more than that, consider the implications of what havoc Satan is wreaking on the youth of this nation. "the whole world lieth in wickedness" ( 1 John 5:19). "And have no fellowship with the unfruitful works of darkness, but rather expose them"
In this edition of SPOTM: Taylor Momsen, Ashton Kutcher, Kevin Spacey, Miley Cyrus and a bunch of sarcastic remarks from yours truly. One of Lady Gaga’s favorite fashion designers, Iris van Herpen, launched her Fall 2014 fashion show in Paris. Called “Biopiracy”, the show featured vacuumed packed models hanging next to the runway. While this display is said to “raise questions” about the patenting of genetics, what it mostly accomplishes is dehumanizing the models and comparing them to pieces of meat. A model walks by as air is slowly being sucked out of the bag next to her. Just another way of adding a disturbing, dehumanizing touch to the fashion world. The fashion world is also all about secret societies. 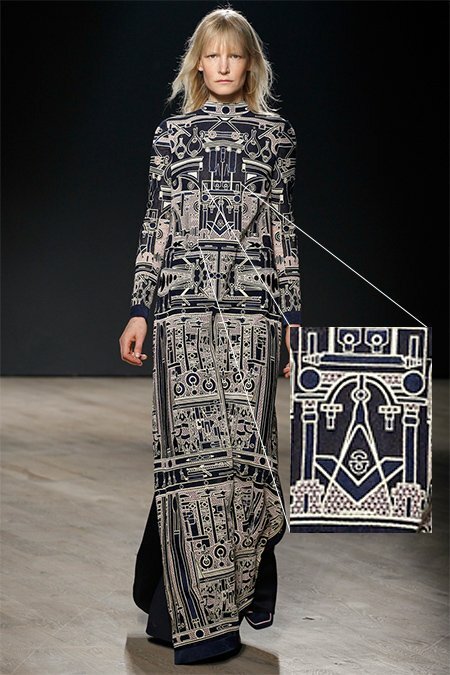 Here’s a design by Mary Katratntzou featuring unmistakeably Masonic imagery. Here’s Taylor Momsen (formally from the show Gossip Girl) sucking on Baphomet’s horn. Yup. That’s basically what you need to do to get media attention from the music industry. Here she is lying inside a “magic circle”, dressed in white as if about to be offered in sacrifice or something. Yup. That’s basically what you need to do to be in the music business. Her album cover features a cross pointing towards her buttocks, going along with the anti-religion agenda in mass media. Yup. That’s what you need to do to be an Illuminati puppet. Speaking of Illuminati puppets, here’s Miley Cyrus posing for Vogue Germany. As stated in previous articles, ALL industry Beta kittens must pose as Marilyn Monroe at one point or another of their career. It was apparently Miley’s turn. Posing as Marilyn is not “fun” or “original” anymore. It is an obligatory rite of passage in the MK industry’s weird world (for more info read the article The Hidden Life of Marilyn Monroe, the Original Hollywood Mind Control Slave). Posing as Marilyn with one eye hidden? That’s 100% Beta Kitten stuff. Miley posted on Instagram her new tattoo: A crying kitty inside her lip. How fitting. 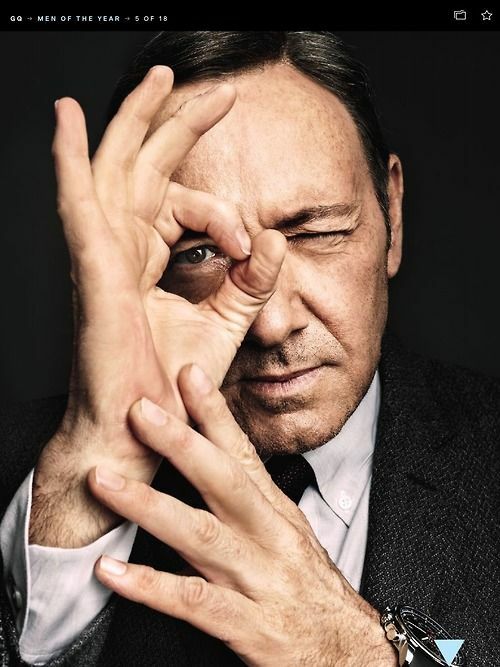 Here’s Kevin Spacey promoting the second season of House of Cards. Yes, he is hiding on eye. Well, maybe its just a coincidence. He’s just indicating the number two with his fingers and one of them accidentally hid his eye. And then the photographers chose that pic to be displayed everywhere. It is just a coincidence. 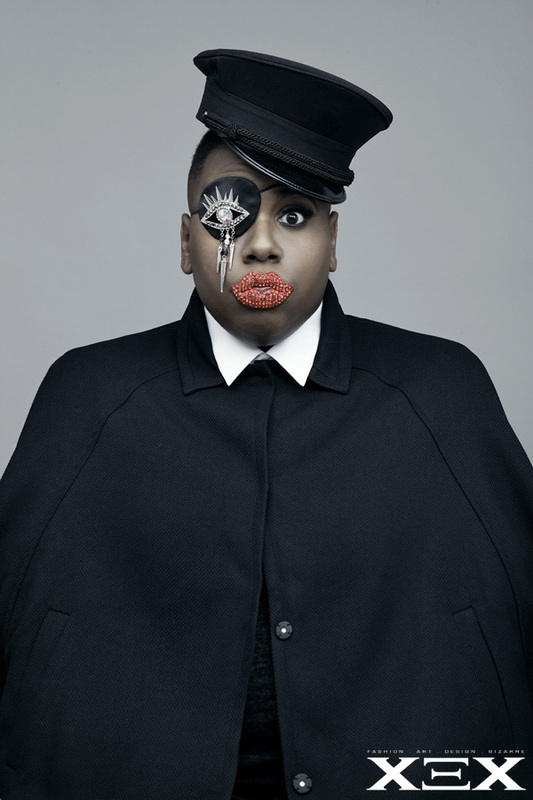 Here’s Glee’s Alex Newell on the cover of Xex mag doing an One-Eye thing. Well, maybe it’s coincidence. Not a coincidence. 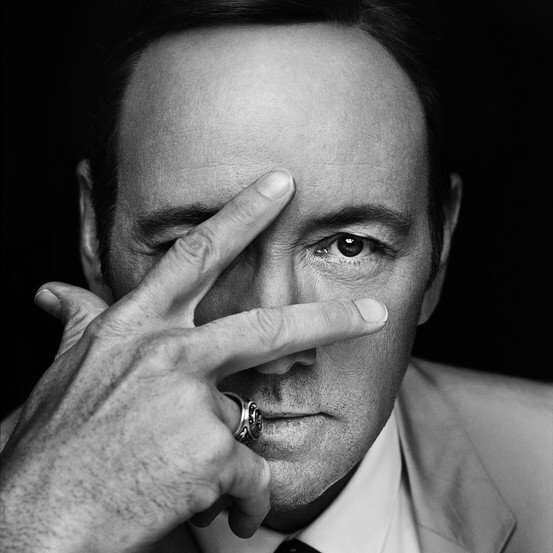 I mean, you’ve got the a clear one-eye sign + fake lips indicating that he is controlled by the industry. 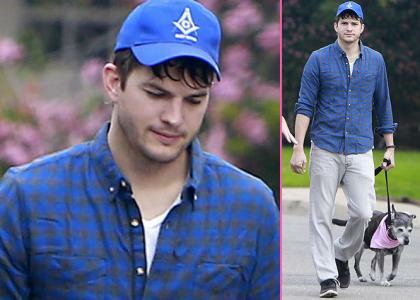 Here’s Ashton Kutcher wearing a Masonic hat. That is all. Despite the numerous harassment allegations against Terry Richardson, model Charlotte Free defended him stating: “There’s plenty of other girls waiting in line, so he’s not forcing you to do sh*t. When you make a choice you have to live with it — unless someone got you f*cked up against your will.” She then stated: “I don’t even believe the accusations against terry…. And if they are true, I still stand by what I said.” Even if the allegations are true? Huh? What she’s saying is probably not surprising since she’s all about the occult elite’s symbolism. Here she is doing the One-Eye sign in Flare magazine. 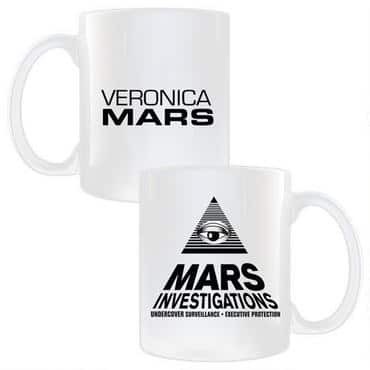 Veronica Mars is a popular TV series (and now a movie) about a young female private investigator. Her logo is a symbol you’ll probably recognize. You can also get this awesomeness on a coffee mug! 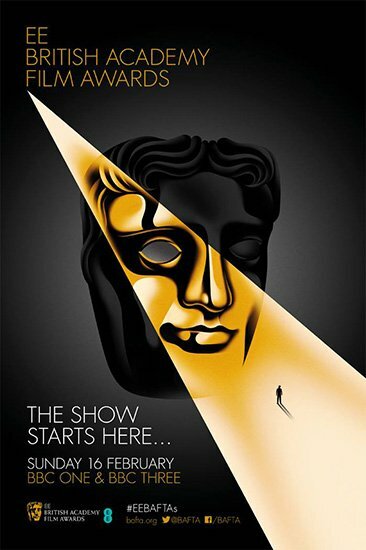 This poster promoting the British Academy Film Awards is quite symbolic. The light comes from “above” (which can represent the elite), goes through one eye (representing the industry) and ends up on a tiny little person. Who is this tiny person? You. Completely in awe towards this light…Unless you’re a vigilant citizen.